Electrical cables directly affect electromagnetic interference in a variety of ways. The most obvious is electromagnetic fields. Cables pick up noise when exposed to electromagnetic fields. And they give off electromagnetic fields when radio frequency current and voltage are present on their conductors. Less obvious is the important way cables affect conducted interference, which in turn affects radiated interference. When a cable is connected between two pieces of equipment, the way the circuits at each end of the cable interact is directly affected by the presence of the cable. At the frequencies of interest for high speed digital data transmission and conducted electromagnetic compatibility compliance, cables can dramatically affect circuit characteristics. Example. Take for example the generic single-ended circuit shown below. A signal is transmitted from the driver along the upper conductor to the receiver and then returns on the lower conductor. Schematically the circuit can be redrawn as shown below. Conductor characteristic impedance is 100µ. Short Cables. For very short cable lengths the receiver looks like 100 kµ in parallel with 2 pF, the input impedance of the receiver IC. If the driver and receiver are very close to one another, the cable conductors may be ignored. 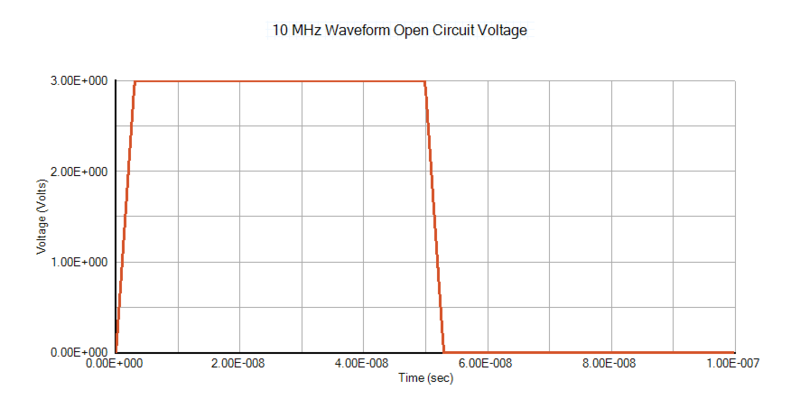 Conductor impedance is near zero and has no significant effect on circuit operation. 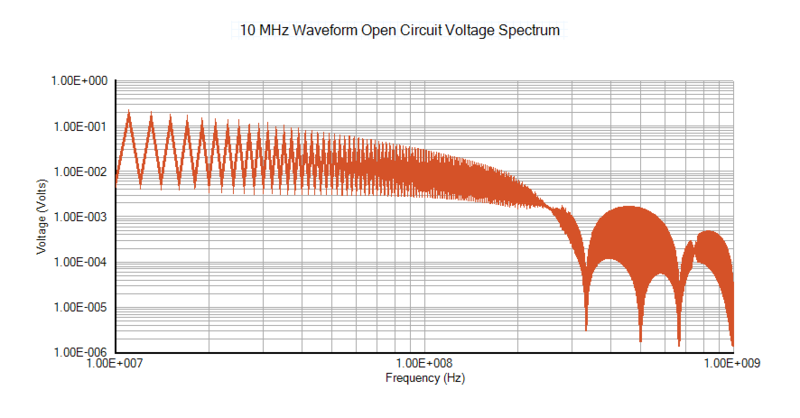 The waveform arriving at the receiver is the same as the waveform transmitted from the driver. Long Cables. However, as conductor length increases, things start to change. As the distance between the driver and receiver grows, the impedance of the receiver as seen from the driver is transformed and the cable must be treated as a transmission line. If the impedance change is large, the ability of the driver to sustain valid logic levels may be compromised. Also, the severity of reflections caused by mismatched cable characteristic impedance and circuit impedance may cause data errors. The received waveform will become distorted, attenuated, and may exhibit ringing and other signal quality problems. As shown in the video below, cable length dramatically affects circuit impedance. As cable length increases from zero, impedance initially decreases due to the capacitance between the cable conductors, which appears in parallel with the receiver. As length increases further the impedance exhibits nulls where the impedance is very low and peaks where the impedance is very high. Nulls occur when cable length is an odd multiple of one-quarter wavelength. Impedance at each null is equal to the resistance of the cable conductors at the frequency of the null. Resistance increases slightly with increasing frequency. At frequencies near the nulls, if the driver is unable to source sufficient current to maintain valid signal levels the waveform voltage at the receiver will be distorted. Peaks occur when cable length is an even multiple of one-quarter wavelength. Impedance at each peak can be very high. It is a function of cable construction and the impedance of the cable end circuit. At frequencies near the peaks the driver voltage may be double its nominal output voltage. 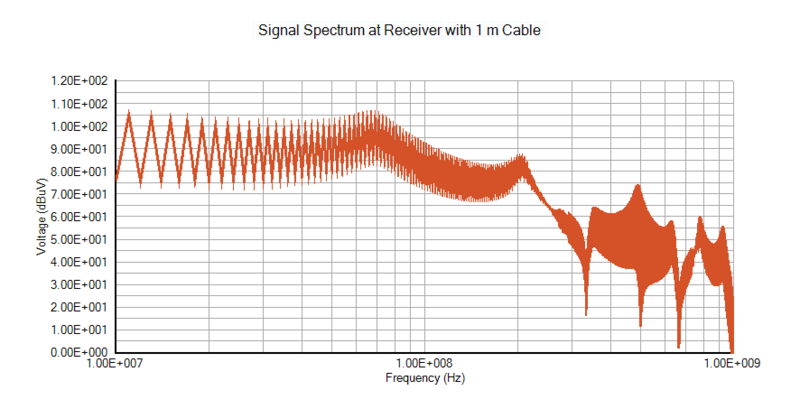 To illustrate what can happen to the frequency content of signals on the cable, consider the 10 MHz signal shown below. Short cable has little effect. When the receiver is connected to the driver with a zero length cable, the receiver loads the driver somewhat and slightly changes the voltage spectrum as shown below. Since the conductor length is zero, the voltage at the driver output and the receiver input are the same. Although the receiver loads the driver slightly, the overall spectrum is substantially unaffected. Corrupted at receiver end. At the receiver end of the cable the voltage can be seen peaking at several frequencies, as shown in the graph below. Around 70 MHz the voltage is 13 dB (4.5 times) higher at the receiver than the driver open circuit voltage. This waveform is very distorted and may exhibit signal integrity issues. At some frequencies the receiver voltage is up to 40 dB (100 times) higher than the voltage at the driver output. EMI affected by mismatched cables. What this means is, the impedance changes caused by the cable have introduced ringing and standing waves on the cables. In addition to signal integrity problems, this noise represents higher conducted emissions and higher radiated emissions from the cable. In a future post we’ll discuss what to do about expected effects of cables on electromagnetic interference. In the meantime, see the EMI Analyst™ product pages and examples in the download area at http://www.emisoftware.com/. Check out the video on YouTube at https://www.youtube.com/watch?v=VB3hWtq7RTQ.